Thomas "Eli" Taylor was born October 13, 1992, in East Point, Georgia. From an early age it was his desire to serve his country and protect its citizens. He preferred to spend time outdoors and target shooting. Eli graduated from Locust Grove High School as a member of the class of 2011. His friends described him like an older brother: someone to look up to, a fierce protector (one even nicknamed him "Batman"), charismatic and loyal. He made a big impact with his infectious laugh. He was known for lifting people up with his strength, energy, and riveting stories of his Army/Ranger days. He was known for the love of his family and friends, never to meet a stranger and willing to lend a helping hand to all. After graduation Eli entered active duty with the US Army. He trained at Ft. Benning, Georgia. From there, Eli earned the privilege of serving with the 1st Battalion, 75th Ranger Regiment at Hunter Army Airfield, Georgia. Eli deployed with the 75th Regiment to Afghanistan in support of the Global War on Terrorism from January 1, 2013 thru May 17, 2013. 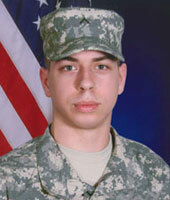 During the deployment, Eli earned the Combat Infantryman Badge. Ranger Taylor was fatally injured in an auto accident on August 20, 2015 at the age of 22. Eli was an only child and is survived by his parents John and Michelle Taylor of Locust Grove, Georgia.